^ 『パタゴニアを行く』 2011, p. 27. 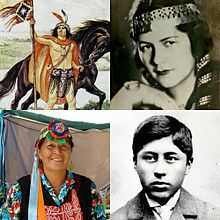 ^ Mapuche o Araucano Archived 2006年11月5日, at the Wayback Machine. ^ Antecedentes históricos del pueblo araucano Archived 2006年11月7日, at the Wayback Machine. ^ Ward Churchill『A Little Matter of Genocide』、109.